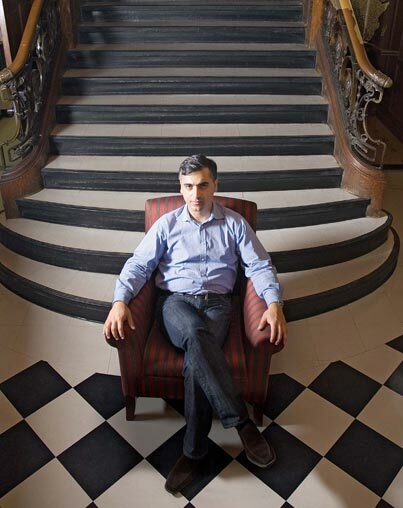 Payam Akhavan believes genocide can be predicted—and prevented. Since his seminal article “Beyond Impunity: Can International Criminal Justice Prevent Future Atrocities?” was published in the American Journal of International Law in 2001, Akhavan has been regarded as one of the most influential human rights thinkers. “The world is the ultimate human rights laboratory,” says the associate professor in McGill’s Faculty of Law. His efforts to bring about reconciliation in Rwanda, Uganda, Bosnia, Cambodia, Guatemala, East Timor and other countries ripped apart by war and genocide have been integral in developing new frontiers for international justice. Driven by his personal encounters with survivors of atrocities, Akhavan is adamant that genocide is not an inevitable part of the future. For Akhavan, early, low-cost interventions—combined with a world community attuned to the warning signs of genocide—are crucial for averting future atrocities. He believes that multilateral organizations like the UN, the North Atlantic Treaty Organization and the African Union can make significant contributions through simple steps, such as preventing hate propaganda or militia activity from metastasizing into organized atrocity. When these interventions occur too late (or, as has so often been the case, fail to materialize altogether), Akhavan advocates turning to international criminal tribunals to punish the perpetrators of genocide. As the first Legal Adviser to the Prosecutor’s Office of the International Criminal Tribunals for the former Yugoslavia and Rwanda, Akhavan played a key role in holding military and political leaders (including Slobodan Milosevic) accountable for their actions. He has also made significant contributions to the work of the recently founded International Criminal Court, the world’s first permanent institution dedicated to prosecuting individuals for genocide and crimes against humanity. Akhavan’s recent scholarship includes an article describing how the ICC has already been instrumental in rousting Uganda’s murderous Lord’s Resistance Army, whose 20-year insurgency victimized thousands of child soldiers. In response to a request from the Ugandan government, the ICC issued arrest warrants for four LRA figures based in neighbouring Sudan. The ensuing international pressure resulted in Sudan withdrawing their protection of the fugitive leaders and, as a result, the gradual collapse of the LRA. As the ICC emerges as a forceful new tool to capture war criminals, its long writ also offers new possibilities for moving toward peace. Akhavan believes the ICC and its powers of arrest can act as an essential tool for marginalizing dangerous extremists. The Court’s presence facilitates both the physical removal of war criminals and their stigmatization in the political arena. This in turn creates space in the victimized society for the re-emergence of peaceful political platforms and a civil social consciousness. Although a strong champion of international tribunals and the ICC, Akhavan is candidly realistic that their primary strength is the ability to warn political elites that genocide can no longer be perpetrated with impunity. Helping victims to heal—and to feel justice has been served—is more complicated and requires a measure of local participation and ownership. “For the people of Rwanda, many of whom have never left their villages, the Tanzania-based tribunal might just as well be in Vladivostok,” he says. “Justice must be done, but it must also be seen to have been done by those directly affected.” International bodies and civil society, he continues, must help implement justice in a manner that accounts for local cultural traditions and information channels. In Rwanda, where there is high illiteracy and limited media, an appropriate means of reconciliation may, for instance, entail assembling large crowds in a soccer stadium to witness a trial, or to supplement international tribunals with gacaca, a form of grass-roots community justice based on village assemblies. His unrelenting but pragmatic commitment to human rights has allowed Akhavan to transcend familiar divides between legal idealists and real-world power brokers; through face-to-face meetings and his scholarship, he is recasting the protection of human rights in realpolitik terms. 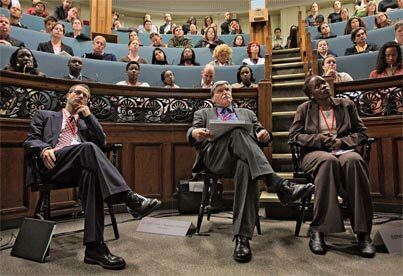 This combination was on display in October 2007 at the Global Conference on the Prevention of Genocide, held at McGill. As the conference chair, Akhavan helped bring together renowned figures from politics, academia and the military—as well as genocide survivors—to discuss human rights. The conference was an exceptional meeting of those on the front lines of atrocities and more remote decision-makers who have the means to prevent such violence. An International Young Leaders Forum also brought together 35 outstanding youth from around the world in a conversation with contemporary leaders to consider a future free of genocide. The conference gave rise to numerous initiatives, ranging from leadership seminars in Ethiopia to reform of the UN mandate on the prevention of genocide. The Global Conference on the Prevention of Genocide was sponsored by the Echenberg Family.